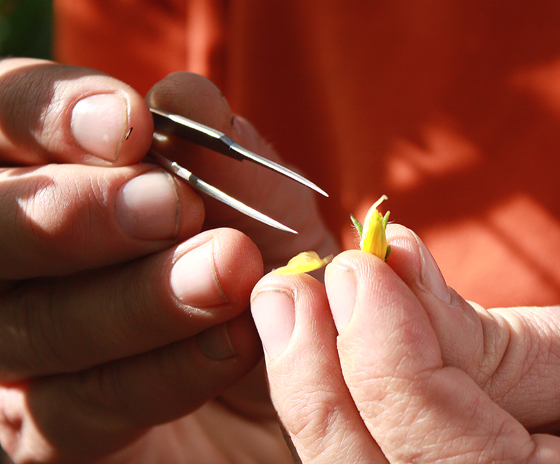 It takes sharp eyes, a steady hand, good tweezers, and loads of patience to create a new tomato from scratch. But Fred Hempel, a geneticist turned farmer, has a knack for it. Owner of the 9 1/2-acre Baia Nicchia Farm in Sunol, he’s already created and named 10 new varieties of tomatoes over the years. You might already have tried a few, as he sells his seeds to Seeds of Change, the certified organic seed supplier, which in turn makes them available to gardeners across the nation. Hempel invited me to his rented greenhouse in Berkeley recently to watch him work his magic on his newest project — a signature tomato for Chef Guillaume Bienaime of Marché restaurant in Menlo Park. Bienaime, who accompanied us that day, has been buying all his tomatoes, as well as winter squash, lettuces, lake, mustard greens and chard for the restaurant from Hempel for the past two years. Hempel grows about 30 different types of tomatoes, many of which you’ll find available in the summer at the Menlo Park Sunday farmers market. 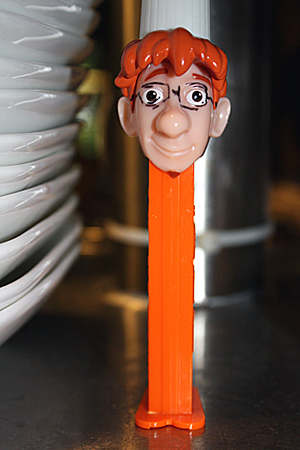 But Bienaime has been eager to add another to Hempel’s lineup, which will be available exclusively to him. That’s OK, because he’s got plenty of time to mull over names. Forget a nine-month gestation period. 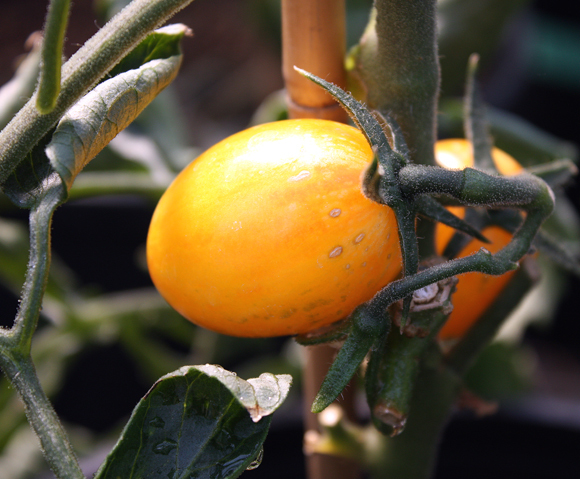 It will take seven generations after crossing breeds for this baby to develop into a consistent tomato. Hempel can speed that up a little because he makes use of a greenhouse. 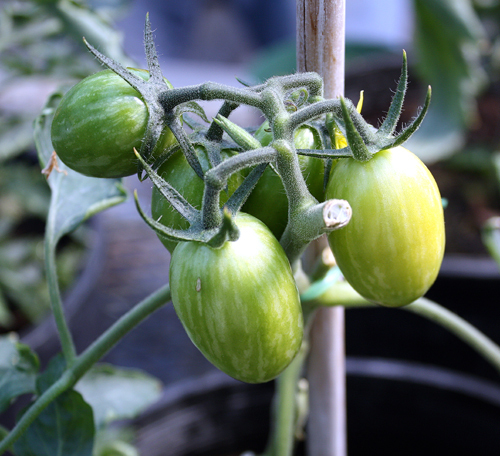 Even so, it still will be about 2 1/2 to 3 years before Bienaime’s tomato fully comes to fruition. Bienaime already knows what tomatoes he wants to cross to create his own: the Amana orange, a large, low-acid heirloom from Iowa that has the ability to hold well for three or four days even after it reaches peak ripeness; and the Costoluto Genovese, an Italian red heirloom from Genoa that’s squat with ridges like a pumpkin, and boasts magnificent flavor. What the end result will look and taste like, though, is anyone’s guess. “You just don’t know what you get until you cross them,” Bienaime says. The greenhouse is where Hempel does his cross-breeding. Inside, where it’s balmy and bright, containers of lovely, elongated cherry tomatoes of every hue are growing, even though it’s still gray and chilly outside. 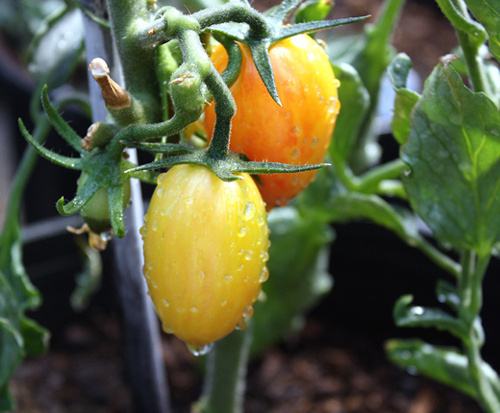 The tomatoes that grow here can’t be assessed accurately for flavor because nurturing them under artificial lights doesn’t result in a flavor as developed as they would have if planted outside in a field. However, Hempel can tell if he’s on the right track or not just from the look of the tomatoes. Plumpness is an indicator of good flavor, he explains. He has rather contrary views, too, about the adage to “pick at its peak of ripeness.” He doesn’t believe it’s best to pick tomatoes like that, but rather a little under-ripe instead. Today, he’s doing the first cross for Bienaime’s tomato. 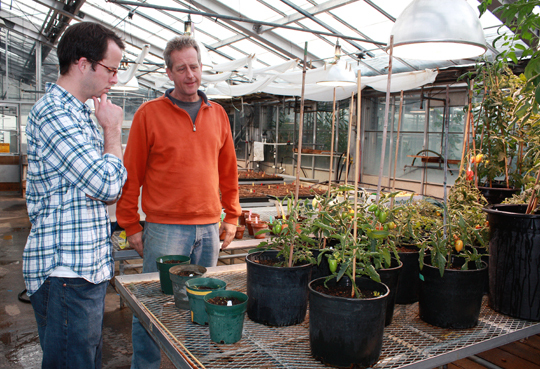 If it takes, he’ll harvest seeds in a few months from the resulting tomatoes, which then will be 50 percent Amana and 50 percent Costoluto Genovese. It’s not until the second generation that the traits really intermingle. When that happens, he’ll select down for the best of the bunch and regrow them. 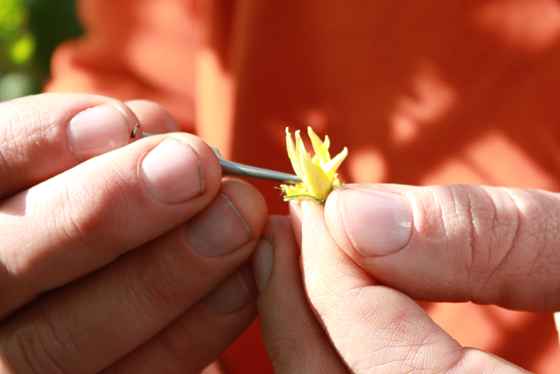 Carefully holding a flower from the Italian varietal in his hands, Hempel uses a tweezer to pluck off all of the yellow petals until only the “female” part of the flower is left. Next, he hunts around on an Amana plant to find a flower full of pollen, tapping it lightly to test the yellow powder that falls from it. 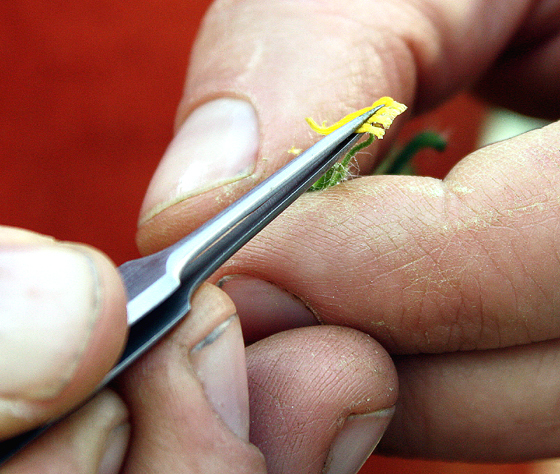 He plucks off the bloom and rubs it on the “female” part of the Costoluto Genovese, hoping the pollen will stick. In a week, he’ll know if the cross took if it starts to grow. 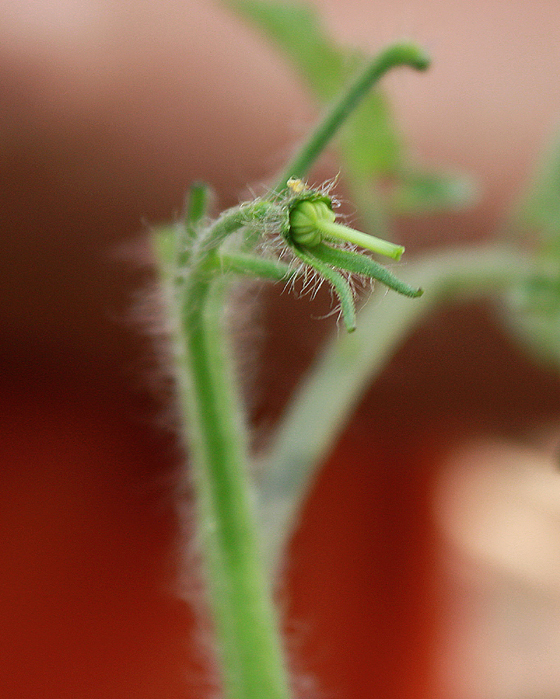 If all goes according to plan, a new tomato star will be born. You don’t have to wait that long, though, if you’d like to try some of Hempel’s other tomatoes and peppers. This year, he’s starting his first Community Supported Agriculture program. Unlike some other programs, which grow primarily for farmers markets, then sell the remainder of the produce to their CSA customers, Hempel is doing the reverse. He’s growing first and foremost for his CSA clients, then selling the rest at farmers markets. Though his summer CSA, he”ll be offering a variety of his incredible tomatoes, as well as squash, beans, melons and peppers, including the sensational pimientos de Padrons. His CSA will run from July 11 until Oct. 22. The cost of a large share is $700; for a small share, it’s $375. 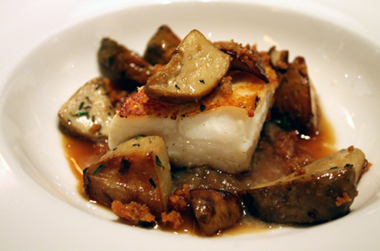 For more information, go to Baia Nicchia Farm’s blog post.